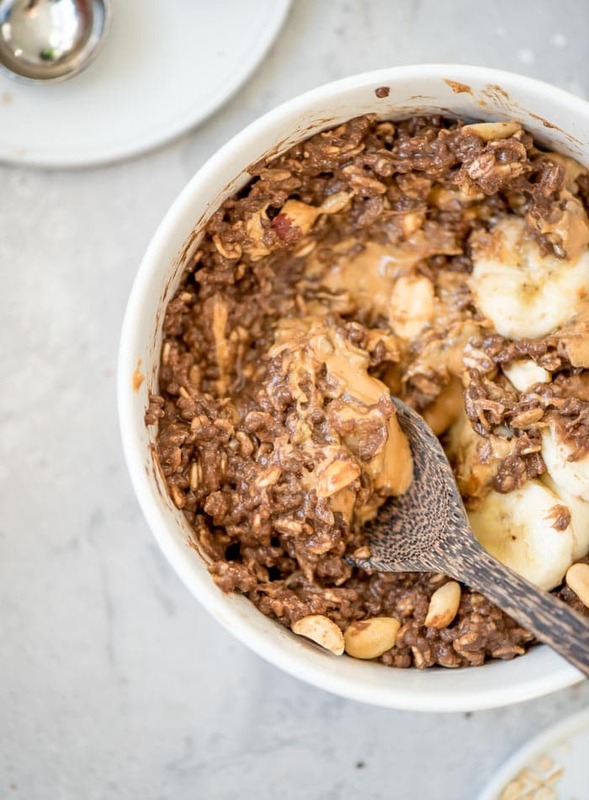 This extra thick and creamy, stovetop peanut butter chocolate oatmeal tastes like dessert but is made with healthy ingredients you can go ahead and enjoy for breakfast. To make this recipe you’ll need rolled oats, cocoa powder, chocolate vegan protein powder, sea salt, chia seeds, banana and peanut butter. 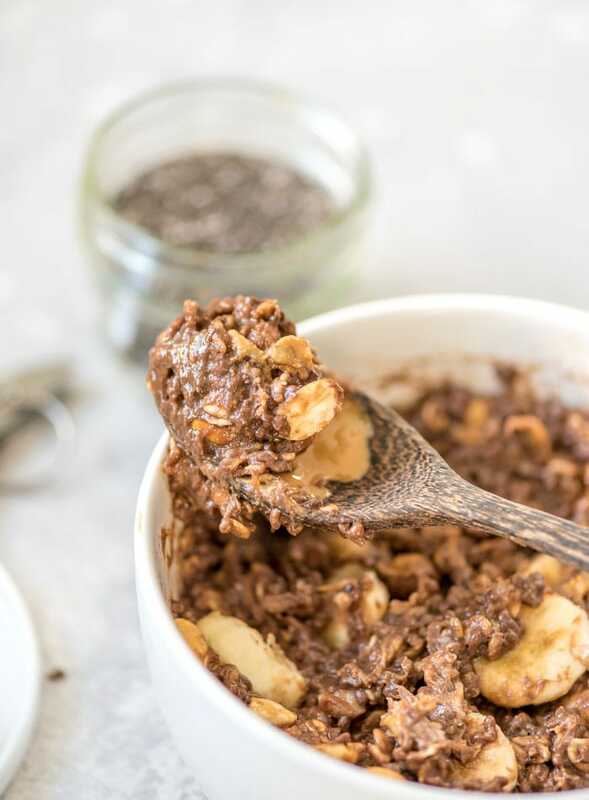 This delicious chocolate oatmeal is vegan, gluten-free, refined sugar-free and high in protein and fibre. If you like a traditional porridge-consistency to your oatmeal, follow the recipe and use 1 cup of water. However, if you want to try them super thick, somewhat like a stovetop version of my brownie batter overnight oats, try reducing the water down to 3/4 cup. Cooking them with less water results in an thick and creamy bowl of chocolate oatmeal with a flavour and texture that falls somewhere between brownie batter and cake batter. You can stir in a bit of almond milk once cooked to adjust the thickness. For more oatmeal recipes and ideas, check out my peanut butter blueberry oatmeal, peaches and cream oatmeal and walnut tahini oatmeal. If you’re looking for overnight oats, check out my brownie batter overnight oats, strawberry cheesecake overnight oats, gingerbread overnight oats and carrot cake overnight oats. 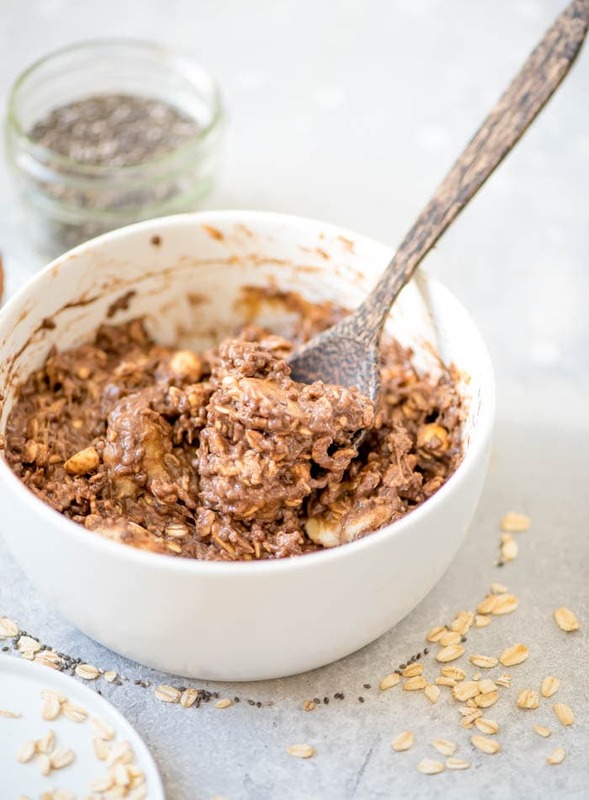 This chocolate oatmeal is ready under 10 minutes. Just bring the water to a boil, add all the ingredients expect the PB topping, simmer until cooked and then let sit for 5 minutes to thicken. They’re thick and creamy, loaded with chocolate flavour, naturally sweetened, high in protein, high in fibre, vegan and gluten-free. 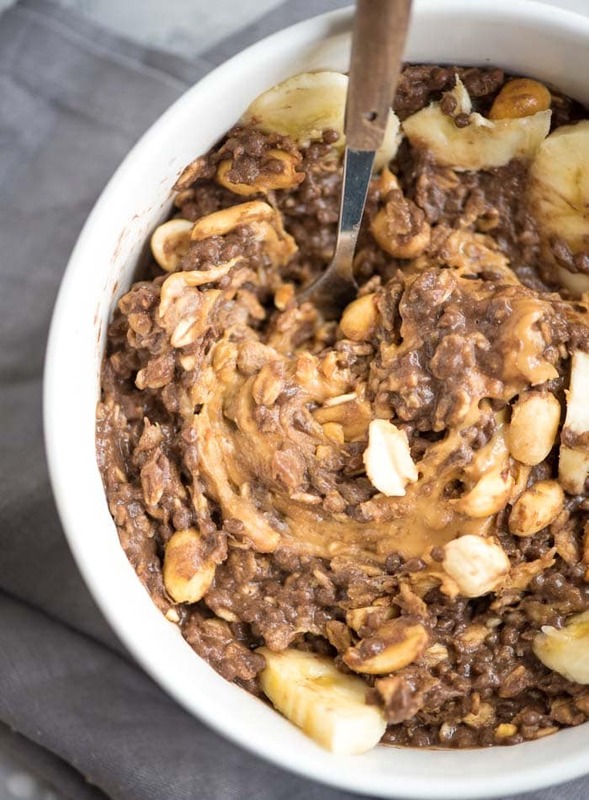 One serving of this delicious peanut butter chocolate oatmeal is 566 calories with 62 grams of energizing carbohydrates, 25 grams of fat and 30 grams of plant-based protein. This recipe also provides 16 grams of heart-healthy dietary fibre and rich in vitamin vitamin E, niacin, folate, magnesium, copper, and potassium, has anti-inflammatory properties. 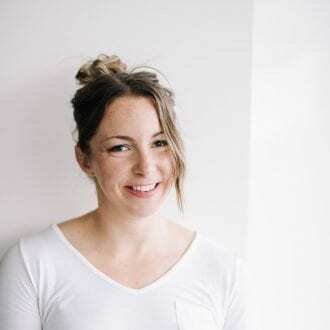 For more information on your daily nutrition needs if you eat a plant-based diet, check out my vegan nutrition guide and list of the best vegan protein sources. Bring the water to a boil in a small sauce pan, then stir in all the ingredients expect the peanut butter, reduce to a simmer and cook for about 6-7 minutes. Stir often to prevent from burning. Remove from heat and let sit for 5 minutes to thicken. You can stir in a 1-3 tbsp of almond milk to adjust the thickness if desired. Scoop into a bowl, top with peanut butter and any other desired toppings and enjoy. Its a yummy healthy breakfast idea which I will definitely have tomorrow morning. I am already looking forward to waking up tomorrow just to have a large bowl full of this! Oatmeal and peanut butter sounds like a very yummy combination! I’m sure it would taste great. Yesss. With a couple minor variations, this is basically what I have for breakfast at least three times a week. It’s so good and so satisfying. OMG, this recipe looks so delish!!! Two of my fave ingredients together ??? ?PB + Oats… need to try this asap! Yes! Give it a try and let me know what you think! PB + chocolate EVERYTHING!! Everything about this recipe has my name on it! Count me in for peanut butter, all day every day! Such a delicious recipe my friend! Me too! Peanut butter on everything, all the time. Chocolate just makes it better! A favorite! This always keeps me full and satisfied. I use to eat this combo daily for breakfast after my workout but haven’t in awhile. You have me craving it right now! Totally, the chia seeds really amp up the volume and make it more filling. I think I need to have it for breakfast today! What a wonderfully rich and hearty breakfast. I love that you add protein powder, too – sneaky and a good way to balance it. I always like adding some protein and fats to my oats for a more balanced meal, helps keep me full longer! And tastes so good! You just can’t go wrong with peanut butter and chocolate. True classic. Sounds like the perfect breakfast to kick off the weekend! Right? Peanut butter and chocolate is the all-time classic combo. And I love this for weekend breakfasts! This looks unbelievably delicious!! Going to make this in the upcoming days!! Thanks for the receipe. You’re welcome. I hope you like it. Let me know how it goes! Now I gonna try this at my home. Yummm…chocolate chips and raspberries sounds perfect. So glad you guys have been enjoying it! Thanks for letting me know, I appreciate that!